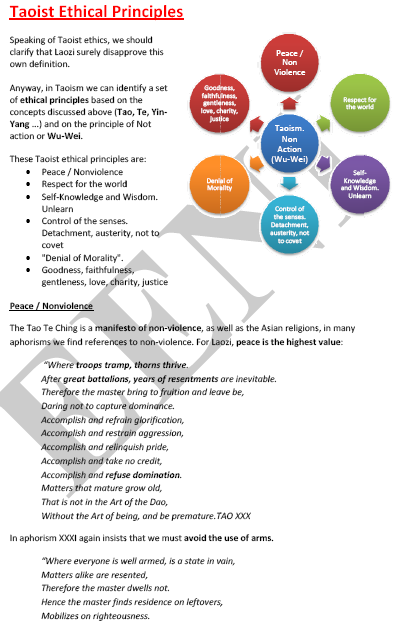 Syllabus of the Online Course (Subject)- Taoism: Ethics (Non-action) and Business (China). Laozi. “My teaching is similar to other... 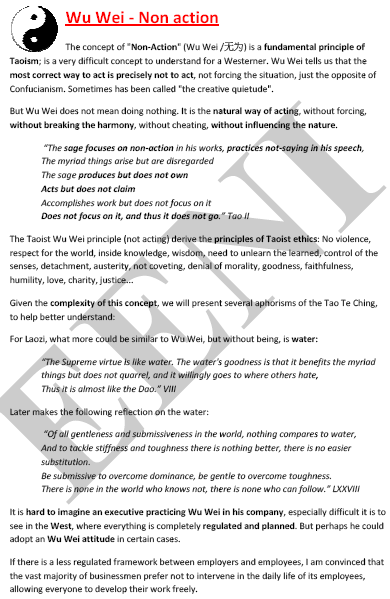 The strong do not die of natural causes; this will be the starting point of my doctrine” TAO XLII. 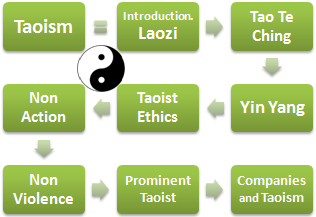 Despite the difficulty of obtaining reliable data on Taoism in China; about 50 million people, mostly Chinese, practice Taoism, a religion (or philosophy) founded by Laozi (the Old Master) perhaps born in 604 BCE and who is credited with the key work of Taoism: The “Tao Te Ching” or “The Book of Reason and Virtue,” one of the shorter books of all religions with only 5000 words. “The Tao Te Ching can be read in an afternoon or a whole life.” Houston Smith. Like Jesus, Buddha, or Confucius, Laozi would not establish any religion. Even though the time has been revered as a God or a Taoist church has emerged. For Taoists, the order and harmony of the universe are manifestations of the Tao. For Laozi there are no human words to define the Tao. The Tao is the cause of everything, its origin, and its end. If people follow the Tao, harmony reigns; if they do not follow it is the chaos. For Laozi, nothing is haphazard. If Confucius treated the Heaven to God, Laozi went one step further. Unlike the Christian concept of God as Creator of the universe, the Tao has never been created, has always existed. Like other Asian religions, the Tao speaks of the “total absence of desire” as the path to follow. The man should not try to modify the Tao; he must let it flow. Yin and Yang are manifested in any being or object, even in thought. In all the Tao; we will find constant references to the dual concept of Yin and Yang. Confucianism and Taoism, Yin and Yang, classicism and romanticism, responsibility and freedom, the two poles of the Chinese society, one would not exist without the other. These two wisdom traditions, along with Buddhism and Shamanism are part of the spiritual heritage of Sinic Civilisation throughout its area of influence: China, Korea, Japan, Vietnam, Singapore, Hong Kong, and Taiwan.